Achieving total comfort in your El Cajon, CA, home requires seeing “the big picture.” You see, your home needs both a dependable air conditioning unit and a reliable heating system to combat California’s hot summer temperatures and cooler winter months. To complete the home comfort image, it’s imperative that you hire an HVAC company with the expertise and services to help. Thankfully, the team at Mauzy is dedicated to keeping El Cajon, CA, residents comfortable—all year long. From furnace installations to air conditioning repairs, you can count on our HVAC services to flesh out the outline for a more comfortable home. The first step toward complete contentment is choosing the right heating and cooling system for your home. This means finding a system that is sized right and has sufficient heating or cooling power to meet your comfort needs. Luckily, El Cajon, CA, residents can rely on Mauzy’s team to help. Our HVAC contractors will examine your home’s layout and your contentment needs to find the air conditioner or heater that’s right for you. Even though HVAC systems are durable, they are not indestructible. So, when you encounter the need for an AC repair or a heating system repair in El Cajon, CA, you can trust Mauzy’s technicians to provide your system with a swift and efficient repair that lasts. Keep in mind, if a small unit problem is ignored, it can quickly escalate to a more costly catastrophe. So, from a minor system hiccup to a major repair, it’s important that you restore your system’s operation right away. This will lengthen your system’s lifespan, eliminate high-energy bills and protect your budget from complete disaster. From seasonal maintenance services to frequent unit checkups, the more TLC you provide to your heating and cooling systems, the more reliable they become—and the more confident you will be in the dependability of their operation. In addition to minimizing the potential for costly repairs, maintaining your unit’s wellbeing allows for it to run more effectively. This not only saves you money, but it increases your system’s energy efficiency and extends your unit’s lifespan, too. When it comes to air conditioner and heater maintenance in El Cajon, CA, there’s no team that will clean, inspect and replace your system’s parts like Mauzy’s team. So, what are you waiting for? A more efficient system is just a call away. If you’re looking to save some serious cash, then look no further. Mauzy’s solar energy systems and residential solar panel installations will do the trick. Instead of relying on electrical companies, solar-powered systems rely on the sun for energy, making them the environmentally friendly way to power your home. It’s time for you to stay happy and comfortable all year long—and our team can help. At Mauzy, we provide high-quality HVAC services at an affordable price every time. 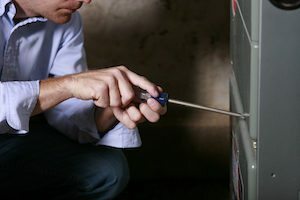 Our HVAC technicians have the hands-on experience and industry expertise to install, replace, repair and service all makes and models of air conditioners and heaters. And, best of all, from heating maintenance to AC repairs in El Cajon, CA, we offer clear, up-front pricing on all of our HVAC services. So, with us, there are no surprises later on. It’s time to start saving money and extending the lifespan of your HVAC unit—and Mauzy’s HVAC services can help. For more information on how our heating, air conditioning and solar energy services can be beneficial for your El Cajon home, fill out our online form or call our team at 858.900.3909 today! Peace of mind is just a call away.